The 40th N Y Monument rests silently where they fought in the “valley of death” between Little Round Top and Houck’s Ridge.3 The unit lost 23 men killed, 120 wounded and 7 missing during their charge down the “valley” on July 2.4 The monument was sculpted by R. D. Barr to represent a member of the unit kneeling behind a boulder.5 . The monument was dedicated on July 2, 1888.6 A member of the 40th N Y returned to the battlefield sometime shortly after the battle and carved, “40 N Y” into a small rock in the valley, presumably to mark the position where they did the most fightingThat carving can be found on a small rock near the southwest corner of the monument base. There are no more living members of the 40th N Y left to tell their story. To this day their monument is all that’s left, to stand guard over their history at the Battle of Gettysburg. Their monument and all the other bronze and granite “Silent Sentinels” on the battlefield are all we have to remind us of the valor, courage and sacrifice that took place upon these fields. 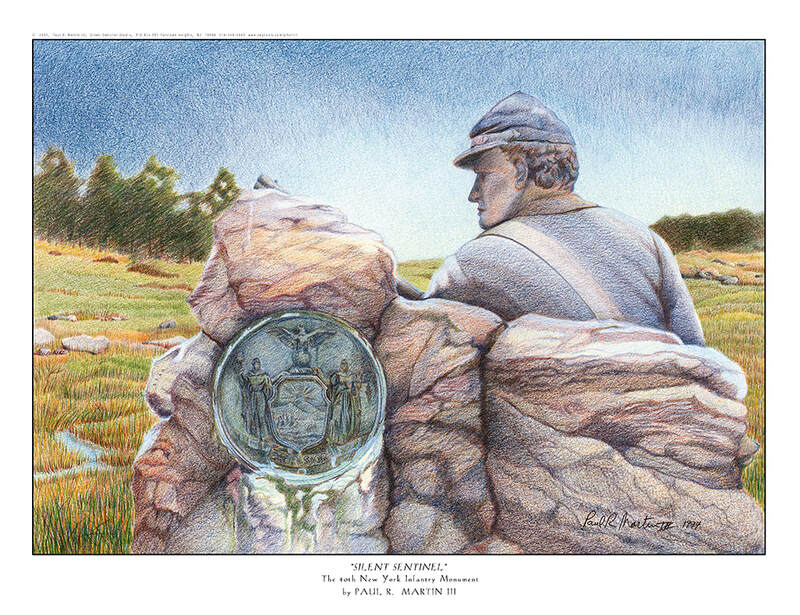 “Silent Sentinel” is dedicated to the memory of the 40th N Y and all that they did to preserve the Union.